During the long summer months, many parents are looking for ideas to support their young children in language and literacy skills. 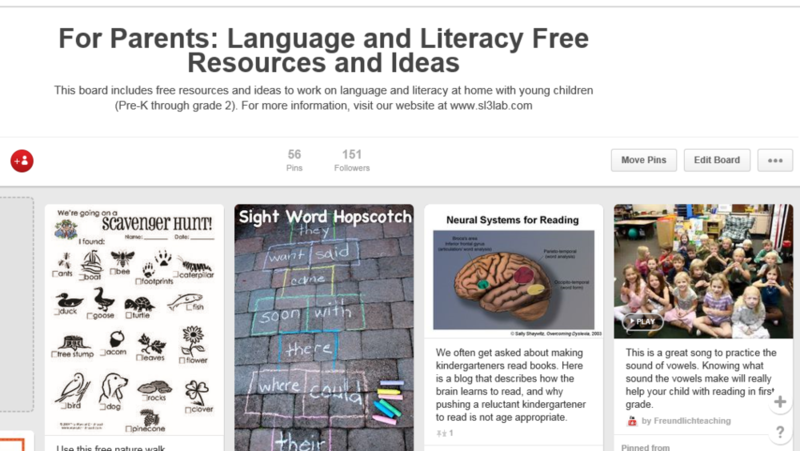 In lieu of printing activity packets for every family, at Speech Language Literacy Lab, we created a Parent Pinterest board. The board includes loads of free resources such as songs, printable crafts, and books. It also has pictures with short ideas that parents can try at home. 1. A link to our Pinterest Parent Board. Please feel free to "pin" our ideas onto your own parent board or to directly share our board. 2. A parent information sheet describing how to create a pinterest account and find our board. Please feel free to modify this information sheet and use with your parents.